A. Jean Ayres believed that children have an innate drive to explore and interact with their world and that these experiences nourish the brain and promote development. Ayres Sensory Integration (ASI) fosters the child's active participation in physical, social, and functional activities using active, individually tailored, sensory-rich experiences to promote skills. 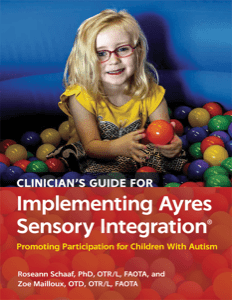 This guidebook describes Aryes's sensory integrative approach and applies it to children with autism spectrum disorder (ASD). Many children with ASD have difficulty integrating sensory information, which affects their behavior, learning, social interactions, and participation in daily activities. Because the sensory integrative approach is frequently used with this population, guidelines for its use are essential. This guidebook's intervention, developed and tested in a randomized controlled trial, provides clear color-coded steps and descriptions in a manualized format. The step-by-step guide includes templates and forms to organize and direct each step's application to practice and research, which are also downloadable. Two extensive case examples take readers through each step, illustrating practical, clinical use.